12.15 p.m. - 2.15 p.m.
Divine Chaos is known for their layered fast & funky combos! With emphasis on technique and sass, this workshop will expand your dance vocabulary as Divine Chaos introduces a series of new Tribal Fusion movements that will focus on spinning and traveling steps layered with attitude to deliver an edgy yet graceful performance! This workshop invites you to take your Tribal Dance to new heights and is designed for intermediate tribal dancers. As a sub focus, this workshop will incorporate innovative lead changes and a variety of formations. We will work with both slow and fast repertoires. 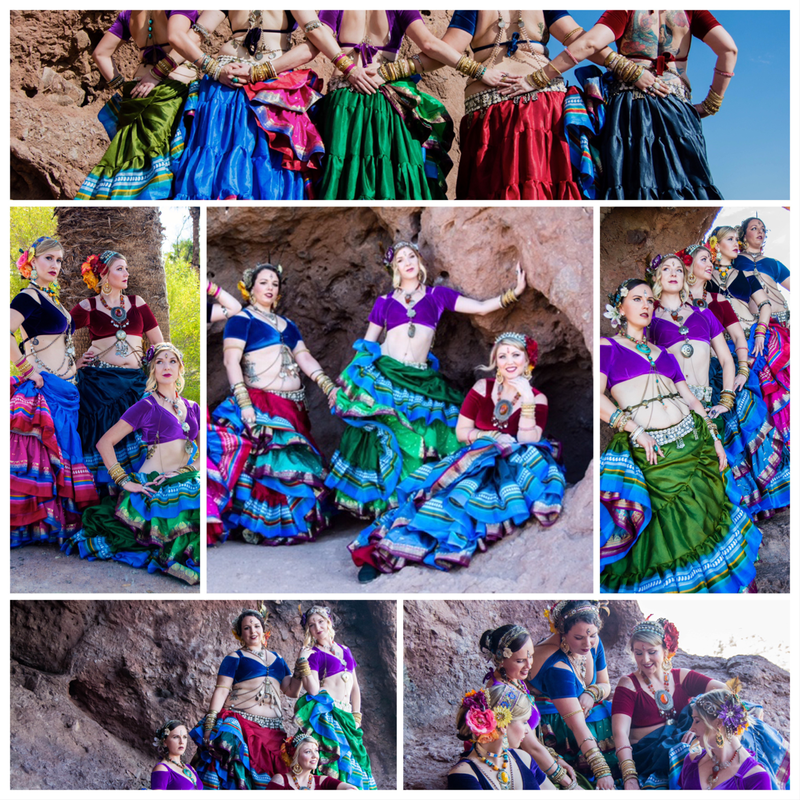 Come, feel the power, as these sassy tribal fusion combos are great for everyone! 2.45 p.m - 4.45 p.m.
A Workshop for all levels that will focus on the technique and making the skirt an extension of the performer. Get ready to swish, swoop and be sassy with DC Tribal's unique Improvisational Skirt Combos! Suitable for all, skirt technique can offer a fun way to liven up your dance. This class includes steps and combinations designed to fit any style with layered movements, spins, and beautiful lines to emphasize grace and precision. 25-yard skirts are recommended. A general understanding of Improvisational dance is recommended for this class, but otherwise, beginners through advanced are welcome. Please bring your own 25-yard skirt to class. All dance levels & styles welcome! 12.15 p.m. – 2.15 p.m. This workshop will cover Saidi combinations and stick work culminating in a modern sassy saidi choreography. The workshop is open to all levels and there will be sticks available to borrow however if you have one please bring it along with some serious attitude! 2.45 p.m. – 4.45 p.m.
Kawliya meaning Gypsy, raqs meaning dance. This workshop is an introduction to Iraqi Kawliya dance, history and culture and music. An energetic workshop with some hair work involved.